A friend of mine is a pro carpenter. He makes furniture mostly and he recently made a custom shelf that stands behind my couch. It’s made out of Walnut and has a really nice dark stain that fits so well in my space. I don’t have any tables around my couch, so this serves as a place to put my tea while I’m reading or blogging. Saving the carpet from spills is the main reason I had it made. 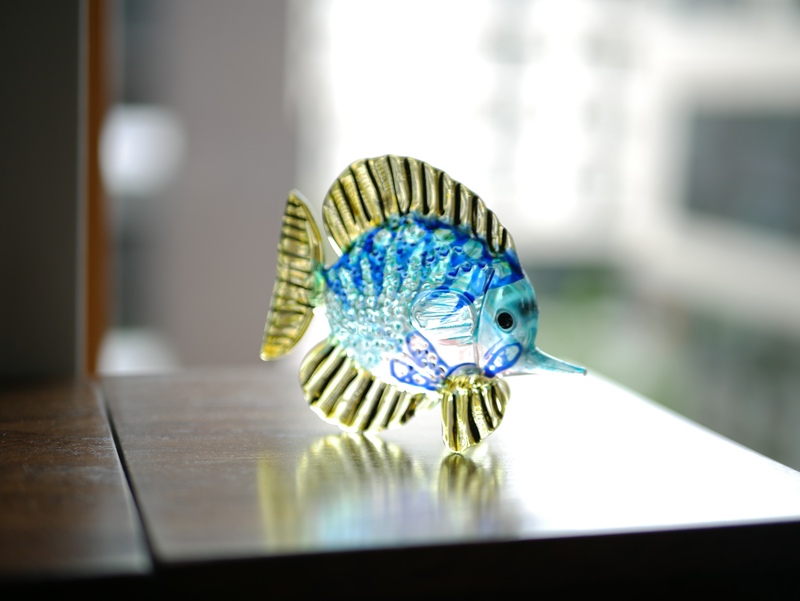 I also have a glass fish, let’s call him Mr Fish. He is meant to be basking in the light, although I didn’t have a good spot for him before my shelf was made. I believe Mr Fish is much happier in this spot where he is in the light and can keep an eye on things for me when I’m not around or busy reading or blogging. Love the photo composition with the reflection. Yes, I do think Mr. Fish is happier now. Too bad you didn’t catch his wink.